Waterfront Airport Hotel and Casino Mactan has officially ushered in the Yuletide season as they unveiled their glittery Christmas Tree with this year’s theme: “Holiday Glitters: The Christmas Tree Lighting Activity”. 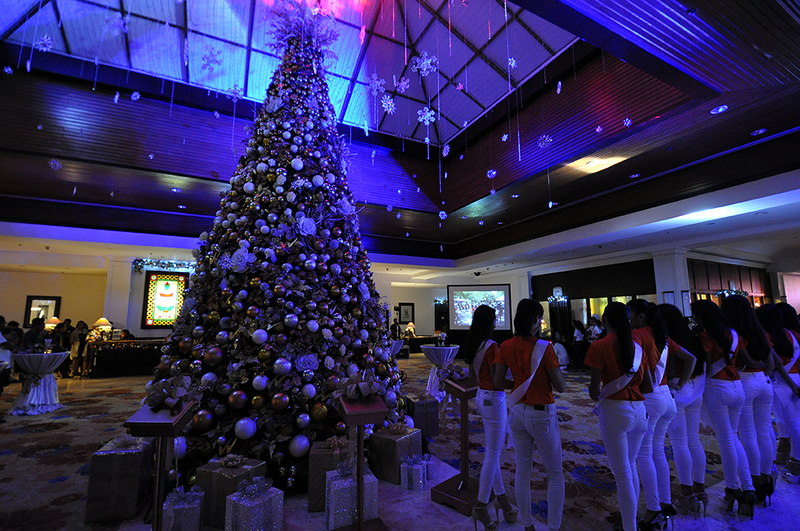 For the record, Waterfront Airport Hotel and Casino Mactan was probably the first commercial establishment in Cebu to light up their Christmas Tree as they held their event on November 6. Together with the Hotel Manager, Rex Benhur Caballes, Lapu-Lapu City Mayor Paz Radaza, and Lapu-Lapu City Tourism Head Hembler Mendoza, the Christmas Tree was ceremoniously lit to shine brightly in the center of the magnificently decorated hallways of Waterfront Airport Hotel and Casino Mactan. And it has been lit! After the activity, we were served with delicious and scrumptious Christmas inspired treats, prepared by the hotel’s very own Chef Marcelo Tesalona, on a very elegant table set-up! It’s a pity I wasn’t able to take a photo of it. Before we left the venue, we were all given a fruit cake (which I loved because it was not too sweet! ), and a gingerbread house! Truly, Waterfront Mactan has set the bar high on how media events should be orchestrated. Cebu Bloggers Society with Y101’s Jiggy Jr.
Christmas is shining brightly at Waterfront Mactan and they are inviting us all to experience the glitz and glamour of this festive season at the Watefront Airport Hotel and Casino Mactan.